Written by a performer and devoted theatergoer, this column will be dedicated to finding the inside scoop on theatrical happenings in and around Boston. Artist profiles and Broadway’s latest news are also up for grabs — there’s no business like show business! 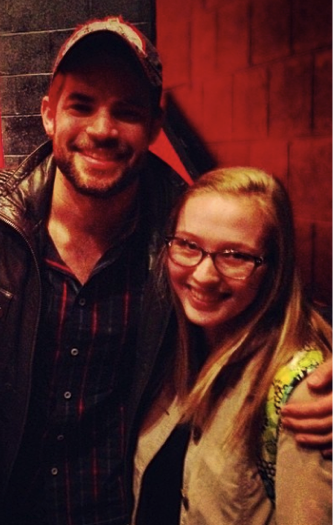 Jeremy Jordan: Broadway heartthrob and TV bad boy with rad vocal talents. Okay, maybe I’m being a tad biased. I should let it be known that I am a huge Jeremy Jordan fan. So when he came to Boston College this past Friday for a Q&A organized by the school’s Dramatics Society, I jumped on the opportunity to be there. For those of you who don’t know, Jordan is best known for his starring roles on Broadway as Clyde from “Bonnie and Clyde” and Jack Kelly from “Newsies,” as well as for his stint as bad boy Jimmy on NBC’s “Smash,” where he played opposite American Idol runner-up Katharine McPhee. He also attended Ithaca College after having begun performing as a junior in high school. If someone wants to explain to me how it’s possible to have that much raw talent, please feel free. When he graduated, though, he struggled to find work right away, and suffered a classic post- college dry spell. “I was a cater-waiter,” Jordan recalled. “It was horrible.” But a year or so later, after singing his heart out at auditions and serving people crummy appetizers, he was cast as the swing in Broadway’s “Rock of Ages.” He confessed that in his audition, he sang his song on his knees while rocking out and totally going crazy — and, as a result, he broke a coat rack that was on the side of the room. “Falling down is better than petering out by doing what’s on the page,” he advised us. This audition technique proved successful again when it helped Jordan land an even better gig as the standby for Tony in the 2009 revival of “West Side Story.” Laughing, he remarked, “I worked for a grand total of 6 hours a week… that’s not going to happen to you,” he chuckled. For those of you who are slightly less Broadway-savvy, Jordan also appeared on NBC’s short-lived show “Smash,” and spoke of his experiences on the show. It was pretty beat-up in the ratings and reviews department, and was cancelled after its second season. Jordan took this into consideration when he recently starred alongside Anna Kendrick in the film adaptation of Jason Robert Brown’s “The Last Five Years,” which will open in theatres in February 2015. “I only cringed at myself three times,” he laughed. “It is a really true adaptation. We tell the songs in interesting ways and put them in real life situations. It is kind of like the first sung-through indie movie ever.” This is great news for anyone who loves theatre and expects the best out of movie musicals. Can we recall “Les Mis”? Yikes! If you’re interested in seeing Jordan work his magic, you can find him starring as J.M. Barrie in Finding Neverland at the American Reparatory Theatre in Cambridge. The new musical, directed by Diane Paulus, is set to move to Broadway in March. I have personally seen it twice, and it is absolutely breathtaking. The challenging role of Barrie has resulted in personal growth for Jordan, and it is his favorite role to date. Skeptical? Don’t believe me when I say Jordan’s got beautiful vocals and natural acting skills? See for yourself and check out this video.